When most companies go looking for a tool tracking program they are doing so to try and save money or prevent tool loss. EC Electric was different. Their biggest motivation was to save time. EC Electric is the largest non-union electrical contractor in Western Colorado. With 50 electricians working out of two offices, they execute on a large variety of electrical projects. These projects are spread over the wide geography of Colorado and thus they often have situations where jobsites are hours from the office. When an electrician on a remote job needs a specialized tool it is critical that he get it as quickly as possible. With ShareMyToolbox the electrician can pull a phone out and use an app to search for the needed tool. Often a tool can be found on a job that is nearby rather than having to drive all the way back to the office. This saves crucial time. Before ShareMyToolbox guys would drive an hour and a half back to the office to pick up a tool only to find that someone else had grabbed it while they were driving. Or they would show up in the morning and have to fight for a tool with other people who needed it. The frustration of not being able to find the needed tool caused the company to often buy more than was needed just to have the needed equipment available. While saving money wasn’t the goal of putting a tool tracking system in place it has been one of the results. Now two job sites that are close together can coordinate on using a single $5,000 bender rather than each site requesting their own. The field personnel now take it upon themselves to see if something is sitting idle nearby before requesting another be purchased. This accountability for tools is a direct result of the ShareMyToolbox app. Kenny the tool manager for EC Electric said “it was like you wrote the app for me”. The focus on the field, the focus on easy of use and simplicity was just what EC Electric was looking for. Kenny started with the free version of the app so he could test it out and make sure the field personnel would embrace the program. After showing it to a few people he got the greenlight to try it. At that point he purchased a month to month subscription and began setting up a tool inventory list. As he rolled the system out to users he expanded the monthly subscription to include the connections needed. Eventually, once the system was completely deployed they upgraded the subscription to an annual plan to reduce cost and be fully committed to the system. It was about saving time. If field workers spend 1 hour trying to find something they are wasting their valuable time. What was the most surprising benefit of the system? Having a good list of all tools and equipment with the value of those tools has been helpful for our accountants. They can now more easily understand the total value of all tools that an electrician has taken out to a job-site. Since workers might take things to the site slowly overtime the office often didn’t notice that there were tens of thousands of dollars of tools on a certain site. Sometimes a small job would have way more tools that you might expect. We now have visibility into this. 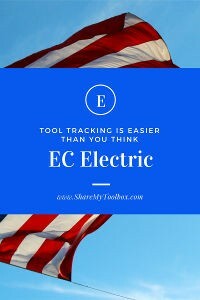 EC Electric company shares their approach to implementing a new tool inventory app to track their tools and small equipment. They found that it was easier than they thought to get the field to take responsibility for tools and the app.